Photo provided by Malindi Elmore. Malindi Elmore arrived at the Chevron Houston Marathon this month as an accomplished triathlete, but hers was an unfamiliar name on the marathon scene. That quickly changed when the gun went off. Even though she didn’t start with the professional women, Elmore delivered an elite-caliber performance, running a head-turning 2:32:10 and crossing the finish line in seventh place. The 38-year-old was the only non-professional to break the top 10 in the women’s race. “If you had told me a few months ago I would run 2:32, I wouldn’t have believed you,” Elmore tells Women’s Running. 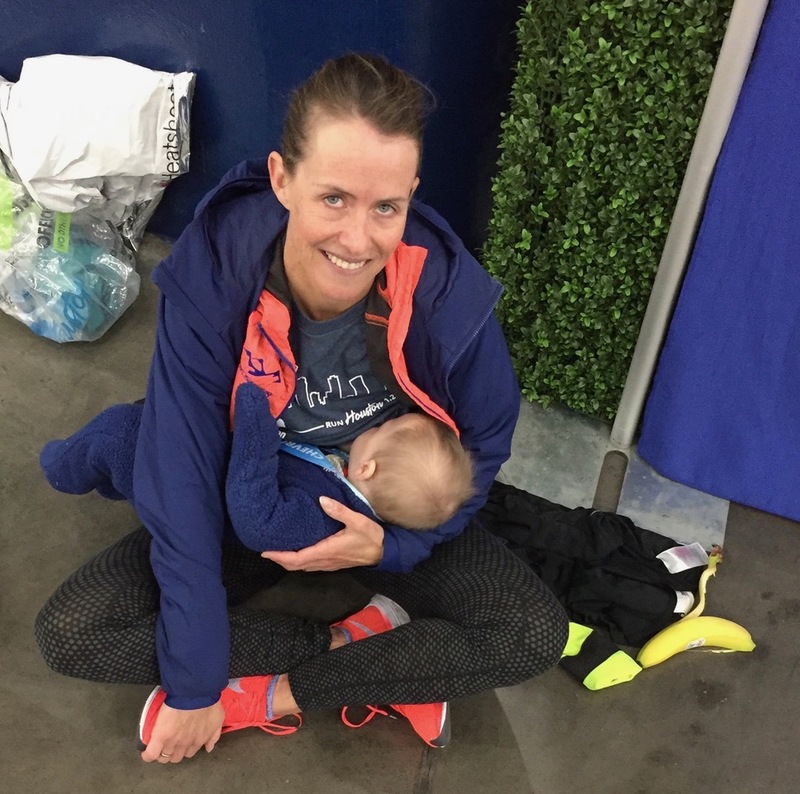 Elmore only decided last September—just a few months after giving birth to her second son—that she would attempt a marathon. As a former Stanford University middle-distance star, 2004 Olympian for Canada in the 1500 meters and successful Ironman triathlete in recent years, Elmore already had an exceptional resume. She had run an impressive sub-three-hour marathon at the end of a grueling Ironman, but longed to take on 26.2 miles by itself. With the help of her husband, Graham Hood, also a former Olympic middle-distance runner turned triathlete, Elmore started training with the goal of running the Houston Marathon on January 20. “I don’t really see myself as a coach here; more of a partner in a fun project,” Hood says. At first, logging lots of miles didn’t feel fun, especially as winter approached in Kelowna, British Columbia, where Elmore and Hood live with their two boys, Charlie, 4, and Oliver, 7 months. In the beginning, she struggled to maintain a 2:40 marathon pace during her hard workouts. “I thought if I broke 2:40 (in Houston) that would be a great day,” she says. Still, she pushed ahead and in December, competed in the San Diego Holiday Half Marathon. She ran 1:12:49, but the downhill-heavy course hit her legs hard—so hard that, after the race, she thought she had torn a quad muscle. She took four days completely off from running and was pleasantly surprised by how good she felt when she returned to it. By early January, Elmore had turned a corner in workouts, showing signs that she could probably run Houston a lot faster than she initially thought. On race day, Elmore and Hood were confident she’d run well. Despite the cold and windy weather, Elmore felt strong through each mile, but knew from her Ironman experience that she had to remain patient. “I was just trying to stay in the moment,” she recalls. Meanwhile, on the sidelines, Hood juggled taking care of their infant and excitedly tracking her progress on the marathon app. “When I finished (in 2:32:10), I was like, ‘Darn it. I wish I had run fifteen seconds faster.’ But that’s always going to happen,” Elmore says. She was greeted by her happy husband—and a very hungry baby. With not much time to catch her breath, Elmore went right back into mom mode and nursed her son. So what’s next for the newbie marathoner? Definitely another marathon at some point. “It was a good experience and that’s what I was mostly focused on. I do it because it’s fun,” Elmore says. She also wants to keep getting faster and is open to representing Canada in the marathon at the 2020 Olympics in Tokyo. (Unlike the United States, Canada does not have a marathon trials race. The Olympic team is selected by Canadian officials). For now, she hopes to run a few shorter road races this spring and continue to enjoy time with her family. As a young middle-distance track runner at Stanford, Elmore says she never imagined she would one day call herself an Ironman triathlete and now a marathoner. But with age and experience, she has found joy in evolving as an athlete.